The high light of Langtang Gosainkunda Trekking are Beautiful Langtang valley, Kanchengompa monastery, Langtang Lirung glacier, Tserkuri Peak, Gosainkunda Lakes and buddhist monasteries at high altitude. One can also climb the Langsisa Peak, Tserkuri peak, Surya peak, visit Gosaikunda Lake and cross Lauribinayak pass. Crossing the holy Gosaikunda Lake is another way of reaching Helambu zone from Langtang. 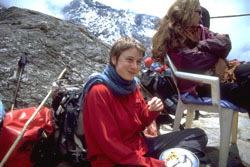 Situated in the central Himalayas, Langtang Gosainkunda trek and National Park are the nearest to Kathmandu. The area extends from 32 km north of Kathmandu to the Nepal – Tibet border. 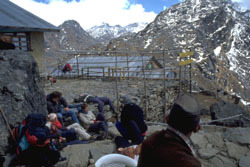 Langtang was designed as the first Himalayan national park in 1970 – 71, and was gazetted in March 1976. While the main reason for the park is to preserve the natural environment, an equally important goal is to allow local people follow traditional land use practices that are compatible with resources protection. This trekking enclosed the catchments of two major river systems. One is draining west into the Trishuli River, and the other east to the Sunkosi River. 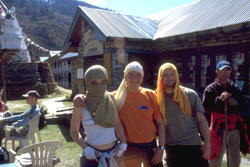 Some of the best examples of graded climate conditions in the central Himalayas are found here. The complex topography and geology together with the varied climate patterns have enabled a wide spectrum of vegetation types. These include small area of subtropical forest below (1000m) Oaks, chirpine, maple, fir, blue pine, hemlock spruce and various species of rhododendron make up the main forest species. Day 01. Pick up from Kathmandu airport 1400 m and drive to Hotel. Over night at Hotel. Day 02. Sightseeing at Swayambhunath and Kathmandu Durbar Square old palace. Over night at Hotel. Day 03. Kathmandu to Sybrobensi by 10 hrs bus, 1460 m.
Day 04. Sybrobensi to Lama Hotel, 2410 m.
Day 08. Kanchengonba to Goretabela 5 hrs trek, 3048 m.
Day 09. Ghoretabela to Thulo Sybro, 3901 m.
Day 10. Thulo Sybro to Chandanbari 6 hrs trek, 3300 m.
Day 11. Chandanbari to Gosaikunda 6 hrs. Day 12. 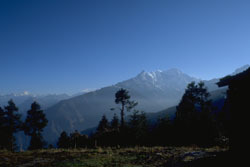 Gosaikunda to Thadepati (3630m). Day 14. Kutumsang to Chipling 5 hrs, 2170 m.
Day 15. Chipling to Sundarijol 5 hrs trek than 1.5 hrs bus to Kathmandu 1400 m.
Day 16: Sightseeing by professional culture guide at Pahupatinath, Bhaudha Nath and Bhaktapur. Day 17: Drive to airport.